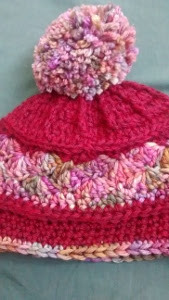 I made January Baby (who we all know is a girl by now) another hat. Her head will be very warm for the rest of her life with a mama who loves to knit and crochet! 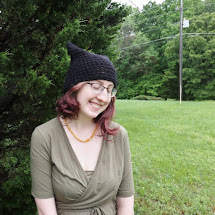 This is the Rose Earflap Hat and I found the pattern on Ravelry. 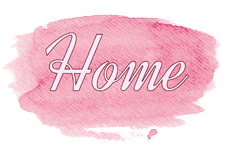 I love how it turned out, and it was was total stash busting project for me! Yay for using up some yarn! 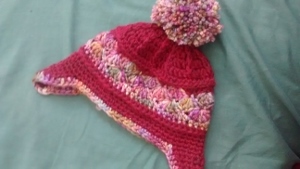 I love the colors in the hat and the pompom. I can't wait to put this on my soon-to-be born little girl. When it fits, I know. Hah. I used worsted weight yarn and a 4.0mm crochet hook.